A historic month by Russell Westbrook, victories in 12 of their last 17 games, and a great improvement in team chemistry. And yet with all that, the Oklahoma City Thunder still find themselves in the same position they were in the first 3 months of the season: outside the top 8 in the Western Conference. After holding on to the 8th position for a couple weeks, the New Orleans Pelicans have retaken the last playoff spot in the West. With the Pelicans holding the tie-breaker against the Thunder, Oklahoma City have to find a way to win one more game than the New Orleans when it is all said and done. This is the 3rd of 4 meetings between these two Northwest Division rivals. The Thunder have won the first two games by an average of 13.5 points. The Wolves were missing Kevin Martin and Ricky Rubio in both of the previous meetings. 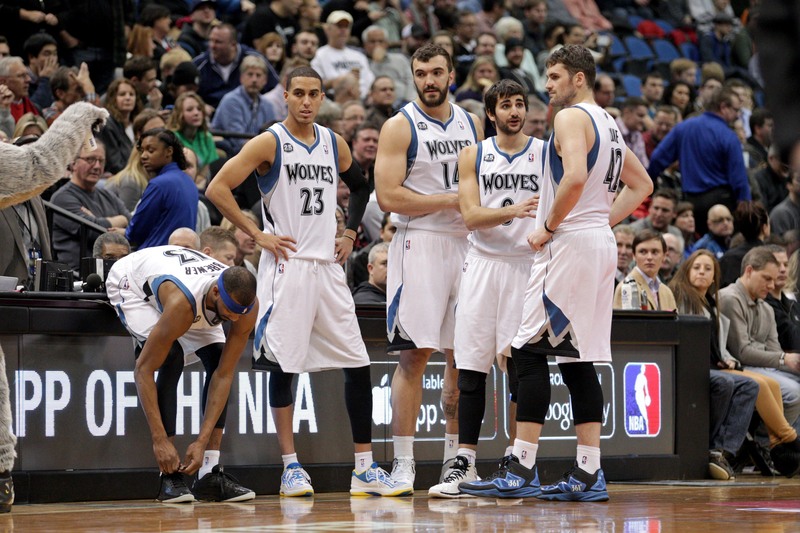 The Timberwolves currently have a record of 14-49, which puts them in last place in the Western Conference. They are currently in the beginning stages of a rebuild, having netted the last two No. 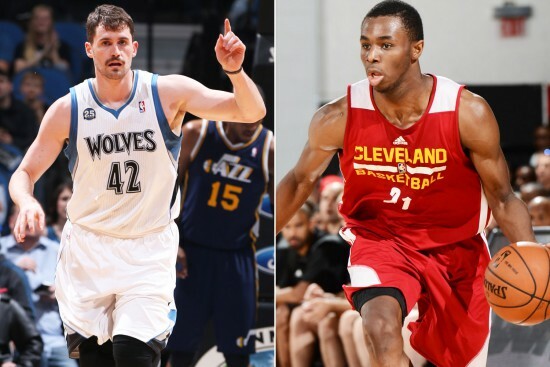 1 picks in a trade that sent Kevin Love to the Cleveland Cavaliers. They are a mix of inexperienced young players and high priced veterans. It is apparent when you look at the stats, that the Wolves are playing more for the future than for the present. 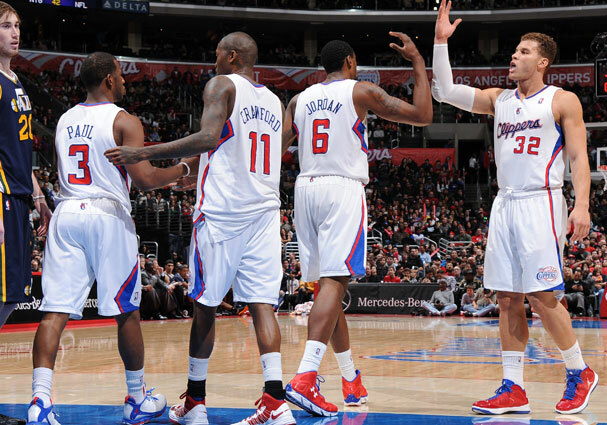 They are 22nd in scoring (97.6 points per game), while giving up the most points per game in the league (105.4 ppg). The T-Wolves attack is led by PG Ricky Rubio who averages 9.1 assists per game. Both the wings are the catalyst on offense, with Kevin Martin averaging 19.9 points on 39.9% shooting from deep and rookie of the year candidate Andrew Wiggins averaging 15.7 points per game. Up front, Kevin Garnett and Nikola Pekovic give the Wolves an experienced post tandem that, while slow, is experienced enough to play around their weaknesses. The bench is a smorgasbord of young players and veterans, mainly featuring Zach Lavine, Gorgui Dieng, Adreian Payne, Gary Neal, and Chase Budinger. 1. 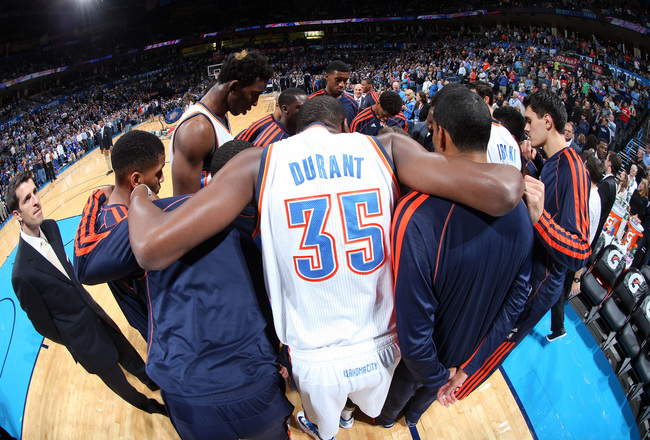 Defense – The Thunder have allowed 111.4 points per game in the last 7 games. Not surprisingly, their record in that stretch is 3-4. They’ve been bad at the two staples of good defense: containing penetration and defending the perimeter. While the Wolves don’t necessarily have a plethora of 3-point shooters, they do have wings that penetrate and draw the defense in. With the Thunder’s penchant for sinking into the paint on defense, it may becomes one of those games where Martin, Neal, or Wiggins go off for 4 or 5 three pointers. 2. The Others – The Russell Westbrook Experience has been exhilarating this past month and a half. But with Kevin Durant still out, defenses are completely keying in on Westbrook, making it extremely difficult for him to get into the paint. In the last three games, Westbrook has averaged 8 turnovers per game, as defenses either pack the paint or have an extra defender shading over to where Westbrook might drive. Westbrook can’t do it alone, and may need more than one other teammate to step up. 3. Trash Talkin’ KG – Steven Adams may have awakened a sleeping beast with his recent comments regarding Garnett and his penchant for sanitary verbalizations. Although Adams was completely complimentary in his interview, Garnett may not take too kindly to his words. Or, he may have softened in his older age and give props to the young New Zealander. Bonus – Must-win – While it isn’t a must-win game, it sure has the feeling of one. Darn you Anthony Davis 30-foot desperation shot. Season Preview – After years of relying on internal improvement/development, the Thunder finally threw their hat into the free agency fray. They failed in getting Pau Gasol or Mike Miller to OKC, but did get the deep-range threat they coveted in Anthony Morrow. If healthy, this team is one of the best in the league. Sporting the current MVP and another top 5 players in Westbrook, the Thunder should benefit from their more versatile additions. 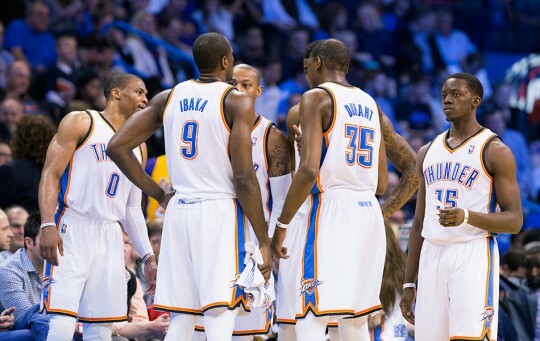 When it comes to a team like the Thunder, though, its all about May and June. With the team’s shortcomings in the playoffs with such a talented roster, might this be the year that coach Scott Brooks starts to feel the heat? Season Preview – The Trailblazers basically bring back the same team as last season, but with a little bit more veteran presence. Chris Kaman and Steve Blake should help shore up some of the inexperience off the bench. With that said, the Blazers’ Achilles heel this season will be the same as last season’s: lack of bench production. Second year guard CJ Mccollum will be expected to fill the production provided by Mo Williams. They were lucky the injury bug didn’t bite that hard last season. They will need similar health next season to produce the same output. Season Preview – I only wrote three names on the “Key Additions” section, but with half the team coming back from injury, you could easily add about 5 players to that section. Now, half the team is a bit of an exaggeration, but the players who are coming back are core members of the rotation. JaVale McGee, Danilo Galinari, JJ Hickson, and Nate Robinson all missed time last season with surgery necessitating injuries. With all those key players coming back and Kenneth Faried coming off a great showing in the FIBA World Cup, Denver becomes the wild card in the Western Conference. Two seasons ago, they were the No. 3 seed in the Western Conference with many of these players on the team. It may take Denver a bit to gel, but I could definitely see them being a nuisance come the second half of the season. 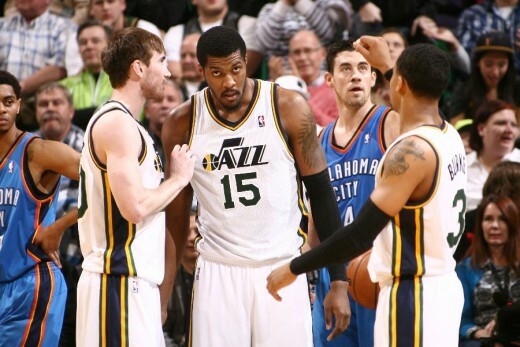 Season Preview – The Jazz are probably at the midway point of their rebuild. Their young guys from 2-3 seasons ago are starting to come up for extensions and they have yet to show much fruit. They had to pay Gordon Hayward max money in order to keep him away from Charlotte. And their backcourt consists of a rookie (Exum) and a 2nd year player (Trey Burke). I think the Jazz take a step this season. Not necessarily a big one, but a 5-7 win improvement through the internal development of Hayward, Enes Kanter, Derrick Favors, and Trey Burke. Show improvement and the team probably stays the course. But, flounder again, and the team may be looking at a smaller rebuild for the future. 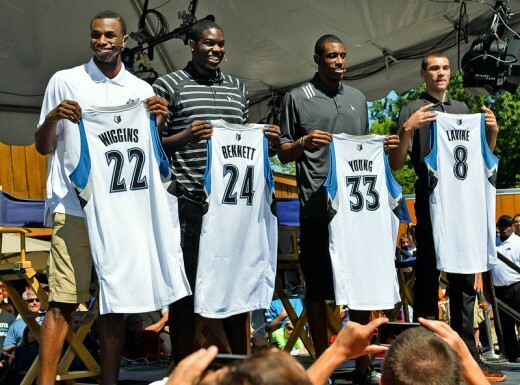 Season Preview – The Timberwolves seem to have a problem holding on to great power forwards. 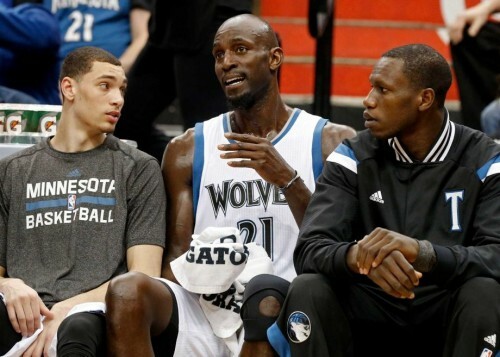 Kevin Garnett about seven years ago and Kevin Love this offseason. But they got a much better haul this time around for Love than they did for Garnett. 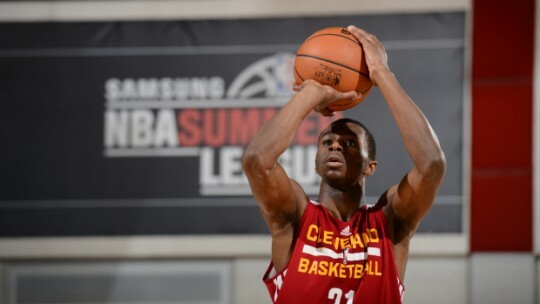 Wiggins has franchise player potential and Bennett has match-up problems potential if he is healthy this season. Thaddeus Young is a good veteran stopgap at the forward spot, but is also young enough to grow with this group. I believe this team will surprise some people. Rubio is made to be a fast break point guard and now has the horses to let loose his talent. In the end though, this team is extremely young and will have plenty of growing pains this season. Luckily, they’ll also be exciting as hell. 2014-15 will be successful if: The Timberwolves’ young players show development throughout the season, and they still garner a Top 5 pick. Part Two of the Russell Westbrook Rest Experiment (RWRE). In Part One, the team looked completely overwhelmed by potential first round opponent Dallas in the game in which Westbrook didn’t play, while looking completely dominant in the game which he did play. It’s too easy to say that the team won simply because Westbrook played. Dallas is an opponent that gives the Thunder problems because of their propensity to score from the outside and because they have a premier score in Dirk Nowitzki. Chicago, on the other hand, lacks both of these traits, which enhances the Thunder’s strengths. 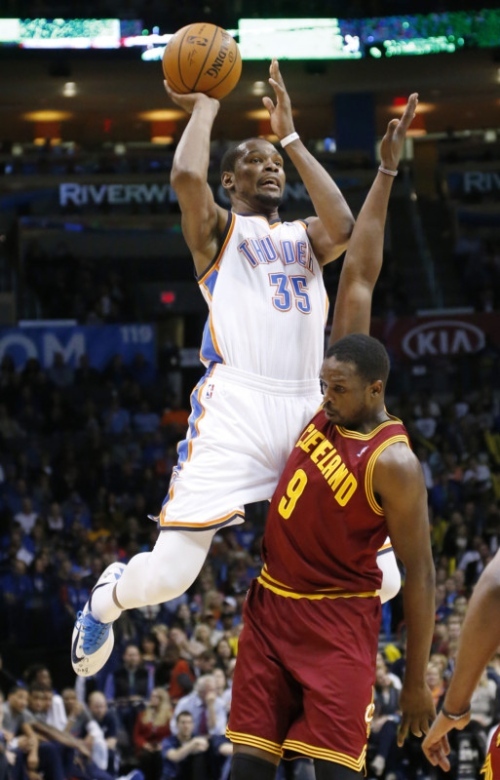 The first game of Part Two of the RWRE sees the Thunder face the Cleveland Cavaliers. This is the second meeting of the season between these two teams, with the Cavs taking the first one in Oklahoma City, 114-104. Every season, Cleveland PG Kyrie Irving seems to have at least one “4th quarter explosion” game against the Thunder. Last season, Irving scored 13 points in the final 2:51 of the 4th quarter to turn a 1-point deficit into a 5-point victory for the Cavs. This season, Irving scored 14 of his 31 points in the 4th quarter to turn a 4-point deficit into a 10-point victory. 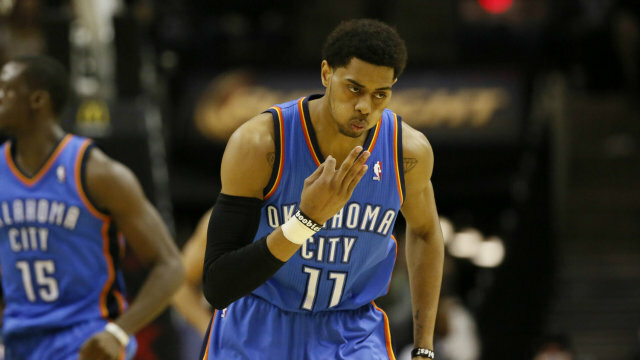 The good thing about tonight’s game: the Thunder don’t have to worry about Irving who is out with a bicep injury. Cleveland was supposed to be one of those up and coming teams that made the jump. A lot like the Minnesota Timberwovles, injuries and inconsistent play have derailed any chance the Cavs have of advancing to the playoffs this season. With a record of 26-42, the Cavs are still mathematically alive in the Eastern playoff race, but with less than 20 games to go, will need some help from the teams above them. Complicating matters is the fact that their best player, Kyrie Irving, may be out for the rest of the season with a biceps injury. In his absence, Jarrett Jack, who has been a disappointment this season, will be running point. On the wing, embattled 2nd year guard Dion Waiters can shoot the Cavs into games and shoot them out of them. Up front, Tristan Thompson is a near double double player and Spencer Hawes is one of the better perimeter-minded centers in the league. Anderson Varejao is still one of the better energy players in the league and comes off the bench for the Cavs. 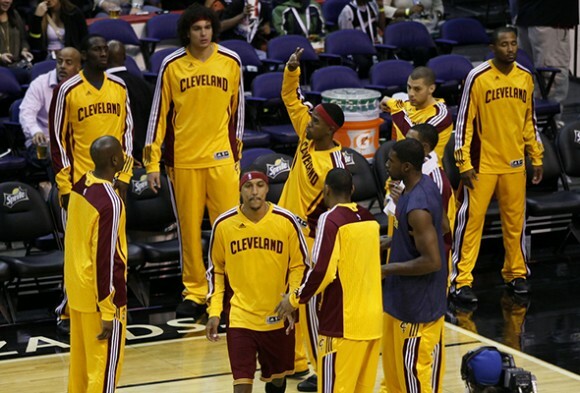 Because of injuries to key players (Irving, Luol Deng, CJ Miles), the bench is stretched about as thin as it can get. 1. Interior Match-ups – With the Cavs PF being more of the inside presence and their C being the perimeter-oriented big, it would make sense to start Adams on Thompson and put Ibaka on Hawes. It would probably make more sense to start with a small line-up, and put Ibaka on Thompson and Durant on Hawes. But we know Scott Brooks would never do that as he has to have a classic center and a classic power forward starting every game. 2. Perimeter defense – This will be the only way the Cavs should keep up in this game. Even if the team decides to sit Westbrook in this game, there should be no reason why the Thunder have trouble against this depleted Cavs team. But if the team plays lackluster perimeter defense and Waiters, Jack, and Hawes all heat up from outside, this could be a repeat of the Dallas or Lakers game. 3. 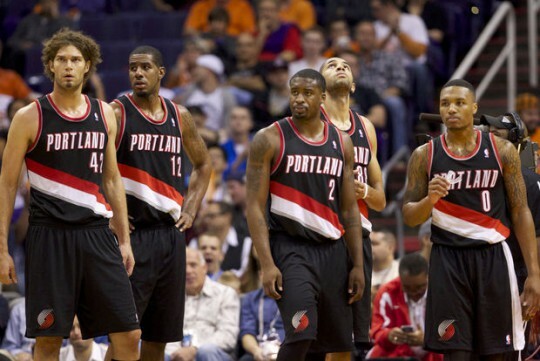 Bench – With a couple lackluster performances behind them, this would be a good game to get some of their mojo back. Maybe Fisher or Lamb can find their stroke again in this game. It only takes one shot to go in. Two games in and I already miss January. It’s kind of a drag having to watch Kevin Durant score only 28.5 points per game. I mean, he looks downright superhuman out there, which is a notch below the deity like figure he became in the first month of the year. After suffering their annual loss in Washington D.C., the Thunder got back on track with a home victory over the surging Memphis Grizzlies. That was their first victory over the Grizzlies in 5 tries without the services of Russell Westbrook. It doesn’t matter whether the game is in Minneapolis or in Oklahoma City, the Timberwolves always seem to give the Thunder fits. The Thunder have held the advantage in the past 5 season, winning 15 of their last 18 meetings, but every game is usually a very spirited affair. It has been no different this season. 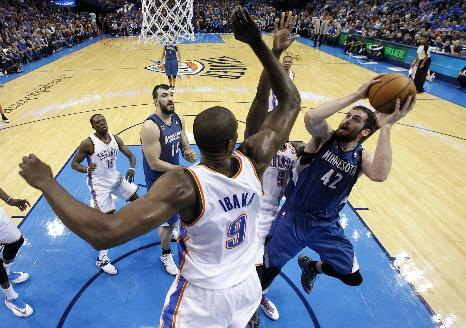 In the first meeting of the season, the Timberwolves blew out the Thunder. 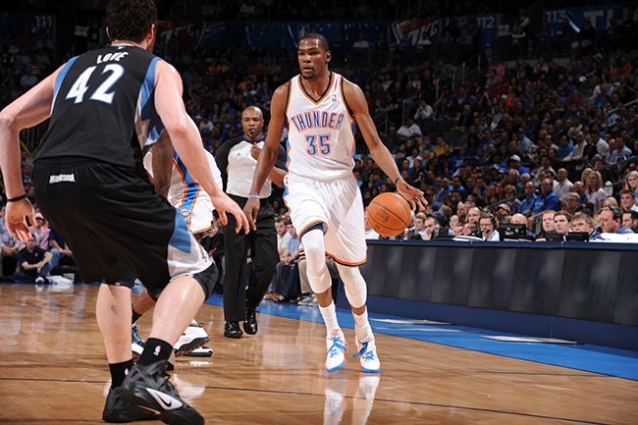 The Thunder returned the favor in the 2nd meeting, winning 113-103. It was the 3rd meeting of the season between these two that was more akin to how their games usually play out. This was the game, I think, that started the Reaping. With the Thunder down by 13 half a minute into the 4th quarter, Durant went on to outscore the Timberwolves 23-21 during the rest of the quarter. His play, along with that of Jeremy Lamb, Reggie Jackson, and Serge Ibaka helped the Thunder come from behind to secure a 115-111 victory. The Timberwolves come into the game with a 24-24 record, 3.5 games out of the 8th spot in the Western Conference. To say that this season has been a bit of a disappointment would be an understatement. With health finally on their side, the T-Wolves were supposed to in the thick of the playoff race, not on the outside looking in. They boast a top 3 offense and are 7th in the league in Margin Of Victory (MOV). But their defense in terms of opponent’s ppg is in the bottom third of the league (20th) and they seem to find a way to lose close games. The offense is guided by PG Ricky Rubio, who’s continues to dazzle as a playmaker, but offers little else in the perimeter game. 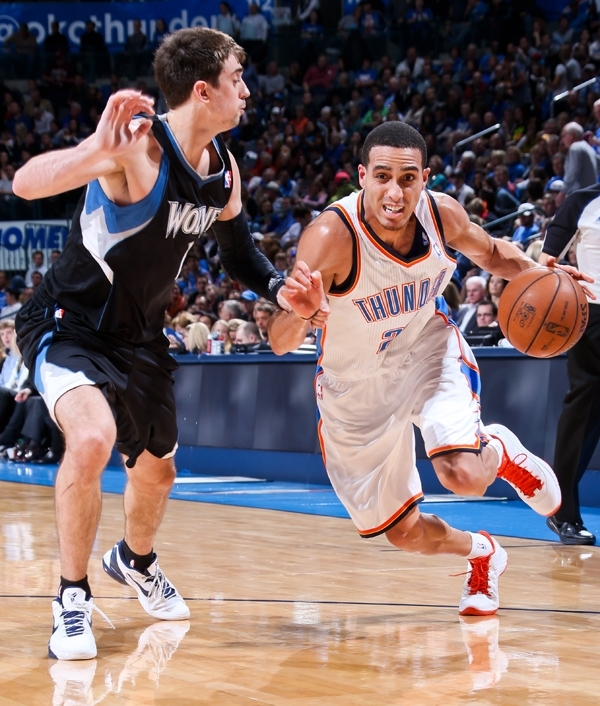 Ex-Thunder 6th man Kevin Martin signed with Minnesota in the offseason and is their second leading scorer. 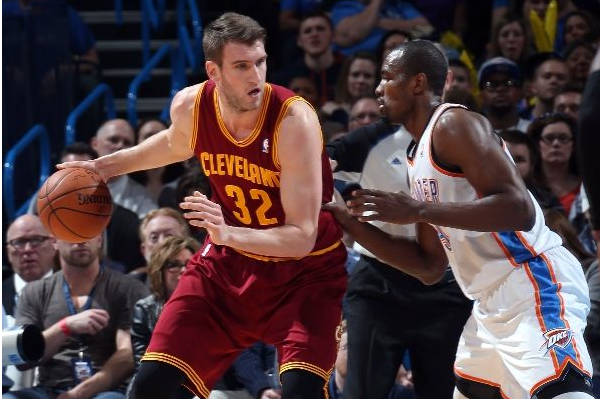 Kevin Love is having an excellent season, averaging 25.6 points and 13.2 rebounds. The Timberwolves’ bench has the ability to be explosive, but is a bit muted because of the absence of Nikola Pekovic and Corey Brewer. 1. Depth – The Timberwolves are currently down 2 starters, and possibly 3 depending how Kevin Love woke up this morning after that nasty fall he took last night. The Thunder’s depth may allow them to blow this game open when the starters are resting. 2. Timberwolves’ Front Line – With Pekovic out, does it really make sense to play Perkins that much? 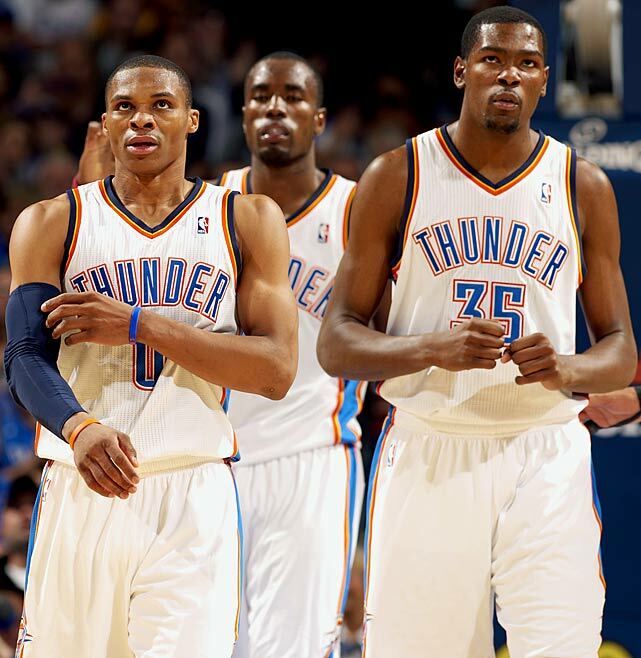 Ibaka and Nick Collison (or Kevin Durant) may be better suited to guard the Turiaf/Love front line, than Ibaka/Perk. 3. Rebounding – The T-Wolves are in the top 3 in rebounds per game. It’s a major part of their game and acts as an equalizer to their lack of defense. Turiaf is a much more active rebounder than Pekovic, and can present a different set of problems than Pekovic’s size presents. It’ll be very important to keep them off the offensive glass. Injuries are an inevitability in sports. When you have bodies constantly in motion, there are going to come times when those bodies either collide or move in ways that cause injury. It’s the reason team sports have reserve players. In the wake of injuries, a team should have a healthy balance of veteran players and young, developing players. It’s the line that allows teams to sustain success while also building for the future. Have too much of either on the bench, and a team risks cutting into their current success or into their future success. The Oklahoma City Thunder have always had a decent balance of veterans and young players on the bench. But with the James Harden trade, they decided to rely on youth instead of looking for veteran help in free agency. At the time of that trade, they received rookie SG Jeremy Lamb, a lottery pick from the Toronto Raptors (that eventually turned into Steven Adams), and an early 2nd rounder from the Charlotte Bobcats (that eventually turned into Spanish guard Alex Abrines, a Euro-stash). 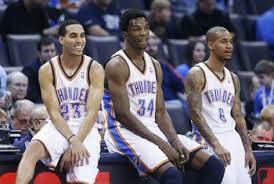 Along with that, the Thunder already had 2nd year guard Reggie Jackson and rookie Perry Jones III in tow. 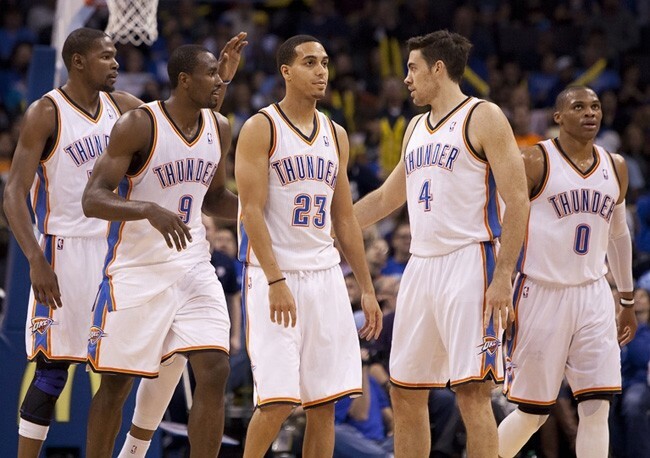 In essence, the Thunder have been grooming this new bench mob for the past season and a half. Another addition to the Harden trade was veteran guard Kevin Martin, who slid into the 6th man role that Harden occupied. Last season’s bench was veteran-laden with Martin, Eric Maynor, Nick Collison, and Hasheem Thabeet getting the lion’s share of the reserve minutes. About a third into the season, Maynor was replaced by Jackson and Derek Fisher joined the team after the All-Star break. The problem with our veteran bench last season was two-fold: there wasn’t any offensive versatility to it and it was inconsistent defensively. The scoring was either coming from Martin or it wasn’t coming at all. As his efficiency declined in the second half of the season, so did the bench’s offensive effectiveness. It got to the point where either Kevin Durant or Russell Westbrook had to be on the floor with the bench unit for it to be effective. Defensively, the bench struggled to match the athleticism of other younger benches. On paper, the bench last season was a good mix of veterans and young players. 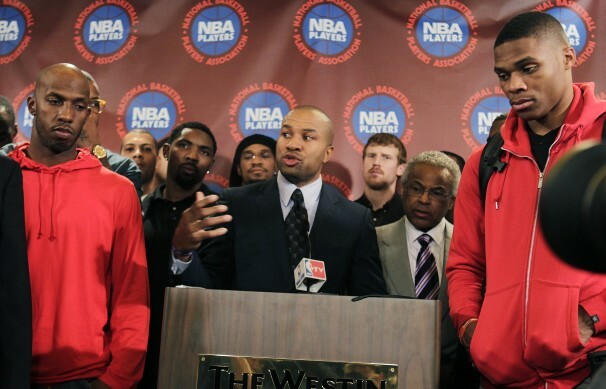 But most of the young players spent their time in Tulsa and never got to test their mettle against NBA competition. Last season, Lamb spent 801 minutes (regular season and postseason combined) in the D-League and only 147 regular season minutes with the Thunder. Perry Jones spent 588 total minutes in the D-League and only 280 regular season minutes (plus 5 playoff minutes) with the Thunder. Now, those two players, along with Jackson and Adams, are being asked to carry the second unit for a title contender. Veterans Derek Fisher and Nick Collison still play a prominent role off the bench, but the team is dependent on the young players to provide the team what the bench couldn’t provide last season, which was offensive versatility and defensive consistency. 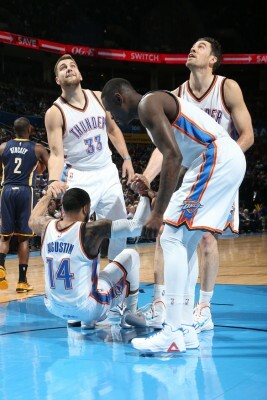 For the most part, the bench was starting to become one of the top benches in the league, before the Westbrook injury. After, though, it has been more inconsistent. And therein lies the problem with depending on such a young bench. When the San Antonio Spurs suffer injuries to their starters, they can depend on veterans Manu Ginobili, Boris Diaw, Matt Bonner, and Patty Mills to come in and step up until those injured players get back. The same goes for the Miami Heat. When their line-up needs to be shuffled, they know they can fall back on the likes of Ray Allen, Shane Battier, and Rashard Lewis. 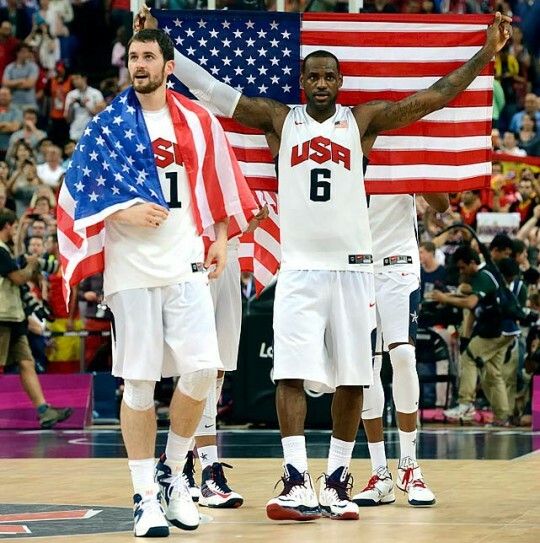 Veterans that not only know their roles, but also have championship experience to boot. These players know how to work through slumps and how to affect games in ways other than scoring. 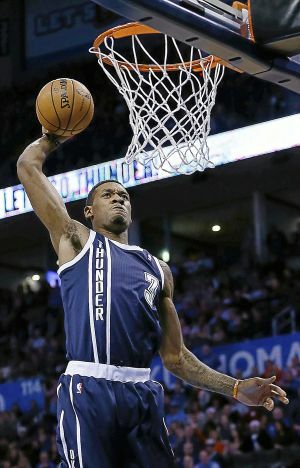 These young Thunder players are just now learning how to do these things. There are positive signs though. The last time the Thunder played the Minnesota Timberwolves, the Thunder were down for most of the game and Lamb was having a miserable game, shooting 2-7 FG with 2 turnovers. 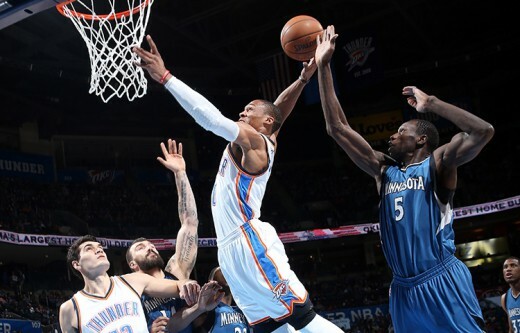 But he found ways to affect the game via his rebounding and defense, and made the plays necessary in the 4th quarter to help the Thunder win the game. Perry Jones has affected numerous games with his defense and ability to hit 3-point shots. And Jackson is showing signs of being a good combo guard, similar to Eric Bledsoe. Reggie Jackson got his baptism by fire in the playoffs last season after Westbrook went down with his knee injury. But other than him, and 5 minutes of Perry Jones in Game 1 of the Houston series, none of the young bench players have any playoff experience. Could that come back to bite the Thunder in the rear during Game 7 of the Western Conference Finals? It could, but nothing teaches quite like experience. Here’s hoping that the growing pains of the regular season turn into the epiphanies of the post season. The Oklahoma City Thunder have had a whirlwind first ten games of the season, but still find themselves with a record of 7-3. A collection of Thunder bloggers and podcasters have stopped by to discuss the beginning of the season for the Thunder. 1. What has been the biggest surprise of the season for the Thunder? Alex Roig, Now That’s Thunder Basketball: The biggest surprise of the season for me was the quick return of Russell Westbrook. After the news broke that he had the arthroscopic procedure and would be out for the first 4 to 6 weeks of the season, I mentally prepared myself for a month of low scoring, frustratingly inefficient games. And this was before the Minnesota game. But alas, Westbrook returned in the 3rd game like a knight coming back from a victorious battle, and all was normalized in the land of the Thunder. Royce Young, Daily Thunder: Gotta be Russell Westbrook’s return, right? Coming back a solid four weeks earlier than expected and completely changing the perception and feeling around this Thunder season. 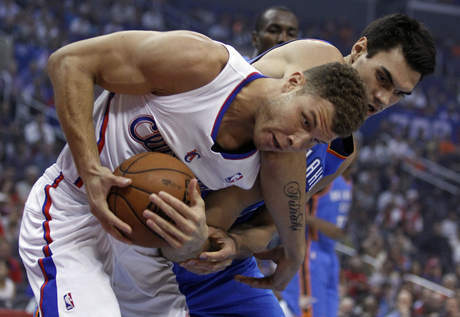 Eli J. Friedman, Thunderous Intentions: The play of Serge Ibaka. When the Thunder lost Kevin Martin, people started to question how Oklahoma City would replace him with a third-option scorer. Many eyes looked to Jeremy Lamb or Reggie Jackson. So far, Ibaka has been that third option. He is averaging a double-double with 14.0 points, 10.5 rebounds, and 2.1 blocks a game. Those are all-star type numbers right there. I didn’t see this type of play coming from Ibaka. Zebulun Benbrook, Welcome To Loud City: The Thunder’s late-game resilience. They’ve had four games so far (Phoenix, Washington, Golden State, and Denver) where they’ve successfully re-gained the lead after trailing for the majority of the fourth quarter and much of the game. You might say that this is the bench unit’s fault, but I prefer to think on the positive side. 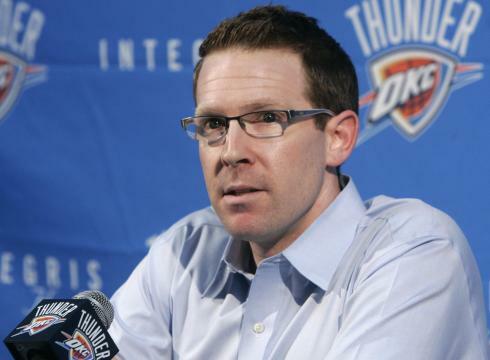 Scott Brooks’ new flexibility regarding late-game rotations has paid huge dividends. 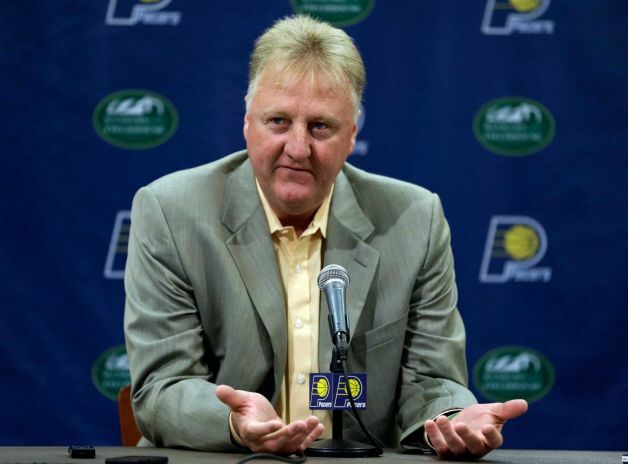 Basically, he lets the starters and bench get equal time as complete units in the first 38-40 minutes of the game. Then when the game hangs in the balance, he throws in the Big 3 of Ibaka, Durant, and Westbrook along with the two other highest performing players, whomever they might be. This allows the team to have the optimal lineup at exactly the right time, and makes for some really exciting finishes. Jay Smith and Andrew Schlecht, Down To Dunk Podcast: Without a doubt, the biggest surprise of the season was the quickness in which Russ returned to the Thunder. After two lackluster games, Russ returned 3-6 weeks ahead of schedule and immediately changed the team. 2. 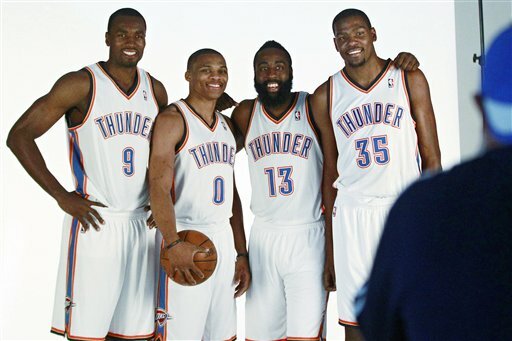 What has been the biggest disappointment so far for the Thunder? Finally! The first prime-time match-up of the year for the Oklahoma City Thunder. Sure, they’ve faced the Dallas Mavericks and the Minnesota Timberwolves, but this is the type of game that the national media salivates for. A game in November that, in actuality, has little to no meaning, but who’s hype rivals that of a match-up in May. Two teams many media pundits have picked as possibly coming out of the loaded Western Conference. The Thunder come into the game having won 4 in a row after starting the season 1-1. They are starting to fall in line offensively, with Russell Westbrook working his way back into game shape and Kevin Durant leading the league in scoring (30.2 ppg). The bench, one of the many question marks coming into the season, appears to be one of the strengths of the team. But, 3-point shooting is still a huge concern for the team, as they are only shooting 27% from deep, good for 28th in the league. 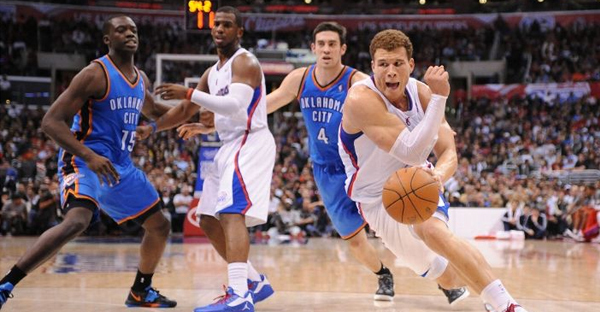 This is the first of four meetings between the Thunder and the Los Angeles Clippers. The Thunder swept the season series last season, with one game going into overtime and the Thunder winning another one by 4 points. Stylistically, these teams are very transition oriented, which usually leads to high scoring affairs. The first part of this series focused on the beginnings of the Thunder organization in Oklahoma City. 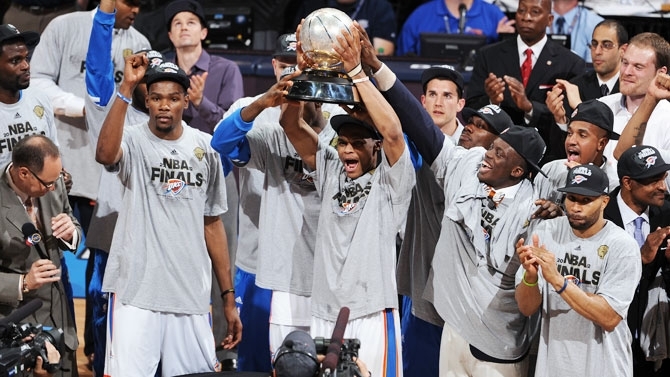 For the second part of the series, I want to focus on what was the apex for these first five years of Thunder basketball, the 2012 NBA Finals. For a little comparative perspective, there are 9 NBA teams (in their current city/team format) that have never reached the NBA Finals. The Toronto Raptors, Atlanta Hawks, Sacramento Kings, Memphis Grizzlies, Charlotte Bobcats, Minnesota Timberwolves, Los Angeles Clippers, Denver Nuggets, and New Orleans Hornets/Pelicans have never tasted the fine champagne of a conference championship. I’m excluding the Brooklyn Nets from the list because they’ve only been in Brooklyn for one season and went to the Finals as the New Jersey Nets twice. The proximity of Brooklyn, NY to Newark, NJ (about 15 miles apart) negates a huge change of fan base because of distance. I’m also excluding the Washington Wizards because they made it to the Finals as the Bullets, but decided to change the team’s name in 1997 due to the negative connotation between actual bullets and WashingtonDC being mentioned in the 90’s as the murder capital of the US. The road to the Finals that season was like the Grateful Dead’s greatest hits album; that is to say a long, strange trip. To begin with, it was a season that almost never was. Although this lockout never reached the DEFCON 4 levels the ’98-‘99 lockout did, it was still nerve-wracking to watch every labor meeting end with the two sides having separate press conferences to disparage the other side. It was like watching your parents, after a nasty divorce, arguing over your custody. When you are a fan of a team that is drastically improving and just entering the prime of its championship window, the last thing you want is a work stoppage. Anything that cuts into a year of your team’s development when you are close to becoming a perennial contender is the ultimate of detriments. The chemistry built from the previous seasons basically gets thrown out the window if players are allowed to sit for 15-18 months with no access to team coaches or trainers. Not to mention, the veteran players would be a year older and there would be a ton of questions regarding roster moves.